“WHITE LIGHTNING“ is finally here stateside in the USA! The most sought after 3 stateroom Marlow 70E-CB built with an amazingly beautiful enclosed command bridge. Meticulous owners love her high gloss interior and customized private entrance from the salon to the master state room giving the owners extraordinary privacy! This Marlow Explorer vessel boasts an enlarged gourmetgalley with the large u shaped country kitchen style settee giving all guest the panoramic ocean views while underway. She is a “must see” and is impeccably cared for, equipped and prepared for her next new owners exciting adventures! Call now for a boarding appointment here in Snead Island, Florida. United Yacht Sales New Jersey would love to guide you through a personal showing of this 70' Marlow 70e-cb 2006. 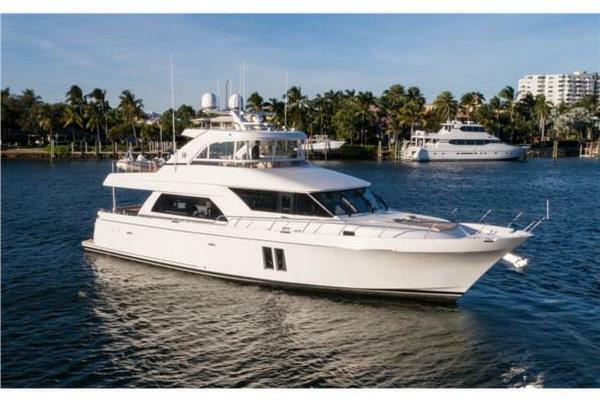 This yacht for sale is located in Snead Island, Florida and priced at $1,445,000. For a showing please contact us by filling out the form on this page and we will get back to you shortly! Click to view the virtual tour:https://www.vpix.net/index.php?tour=453517WHITE LIGHTNINGis striking with her oyster white hull and superstructure.The boat deck was extended to provide a fully protected cockpit where you will find a beautiful teak table that seats 6 comfortably. As you walk around the outside of the yacht you notice the details: no window frames, built-in bow seating, high bulworks which provide safe walkways around the yacht. When you enter the salon from the aft deck she feels much bigger than her 74' because the open floor plan allows you to see all the way through the yacht to the front windows for panoramic viewing. The beautiful teak interior is one of only a few done in high gloss which brings out the richness of the grain. The built in seating on the starboard side also features a large coffee table that raises and lowers so you can eat here as well. The flat screen TV is on a lift so it can be hidden away when not in use. There are two comfortablechairs with a nice storage cabinet/table across from the built in seating. The forward end of the salon features a full bar including an ice maker and full size wine cooler. The private stairway to the master stateroom is located in the forward starboard corner of the salon. The galley is a few steps up from the salon and adjoins a large seating area where 6-8 people can dine in comfort. The galley features the finest appliances from Wolf and Sub-Zero. The granite countertops are stunning and there is plenty of room to work. Heading down the curved stairway to the staterooms, your attention is focused on the quality of the wood, recessed hand rails, and the finish of the teak. Forward is the VIP stateroom with a queen size bed, en-suite head and shower. Moving aft and to port is the guest stateroom, with an en-suite head with shower. Again the fit and finish is a work of art. You enter the Master Stateroom from the forward end of the salon. The king size bed is athwartship allowing the creation of a very large head on the port side.There is a shower and bath combination andthere are two sinks widely spaced on a beautiful granite top. The stateroom has lots of full length hanging lockers. At the aft end of the room there is a lower nook that houses the washer and dryer and a desk area. As you head up to the Command Bridge, either from the pilot house or by the cockpit stairway aft, you realize the size of this yacht. The command bridge is stunning with its high gloss teak interior. Aft of the helm station there is a large L shaped settee with a table. This area invites you to sit back, relax, and enjoy the moment whether underway, at anchor or dockside. There is seating for up to seven people, icemaker, sink, and a grill, plus lots of storage. When entering the salon from the cockpit your attention is captured by the vast amount of space in this area. As you look forward and to starboard, you notice a very comfortable settee and coffee table, and forward there is a 42-inch Sharp plasma TV that lifts out of a custom teak cabinet. The Bose Lifestyle 48 multi zone home theater system with surround sound, is also wired throughout the yacht and the deck area has its own remote control. Directly across from the settee and coffee table you will find two comfortable chairs with a nice teak cabinet in between. Also to port is the granite wet bar, with an ice maker, refrigerator, glass and liquor storage, wine cooler and a sink. At the forward end of the salon you will find the stairs to descend to the master stateroom. Up three steps from the salon is the galley, which is a state of the art gourmet kitchen. The very large granite countertop provides more space than will ever be needed to serve that special dinner. Custom teak cabinets and dovetailed drawers, both completely finished inside with Formica, provide large amounts of storage in the galley. For convenience and safety, just to port of the galley, is the stairway up to the command bridge, the port pilothouse door, and the electrical panels located in the aft section of thegalley settee. As you descend down the stairs from the salon to the master stateroom you notice the high gloss teak interior bounces the natural light provided by 6 opening port lights creating a warm open feeling. The king size bed is athwartship to starboard providing space for the large, full length head to port. There is a 32-inch Sharp flat panel TV for comfortable viewing. Full length cedar-lined closets are on the forward wall and two chests of drawers are aft providing ample space for living aboard for extended periods. There is a lower office/laundry area aft of the main stateroom. A full size Asko washer and dryer are neatly tucked away behind louvered teak doors. The master head in this stateroom is exceptional. The shower and both combinationcountertop with twin sinks, toilet, bidet, and even a clothes hamper are well thought out and a couple will have no problem sharing the space. There are 3 opening port lights in the head that let in plenty of natural light. The VIP stateroom, located in the bow of the boat, has a queen size island bed, cedar-lined hanging closets on both sides and a 20-inch Sharp flat panel TV. Under the bed are six drawers that are finished with twelve coats of varnish and lined with Formica. Also under the bed are two Cablemasters for the forward power cords. The chain locker also resides in this area, as does the bow thruster. The en-suite head with separate stall shower is made of the finest materials, Grohe fixtures, granite sink tops and a Headhunter toilet. The guest stateroom has upper and lower twin sized beds and en-suite head with shower. The bunks are offset 90 degrees providing a much more open feel then traditional over and under bunks. The 15-inch flat screen TV provides entertainment for guests. A neat cedar-lined closet has room for hanging clothes, and under the lower bed are drawers that provide more storage. Entry to the engine room is from a flush hatch in the cockpit. The watertight engine room door has a window that allows you to check the engine room before opening the door. Upon entering the engine room you immediately notice the head room of more than 6 feet. This is a white engine room accented by polished stainless steel piping and engine beds and it is spotless. Every piece of equipment is like new. The twin engines are soft mounted to reduce vibration, and coupled with the Aqua Drive system further reduce vibration. The sea chest forward and between the engines provides sea water for every piece of equipment that needs it. There are no little strainer baskets to clean on this yacht. WHITE LIGHTNING is one of the finest examples of the Marlow Explorer. A combined effort of Marlow Explorer staff and an experienced owner together have created a boat that has performed above all expectations. An excellent cruiser in all types of weather, efficiency of 1 gallon per mile at 8 knots or cruising at 19 knots, this boat provides an excellent comfortable, safe cruise. "White Lightning" is a beautiful yacht and her Command Bridge and high gloss teak interior makes her truly one of a kind. 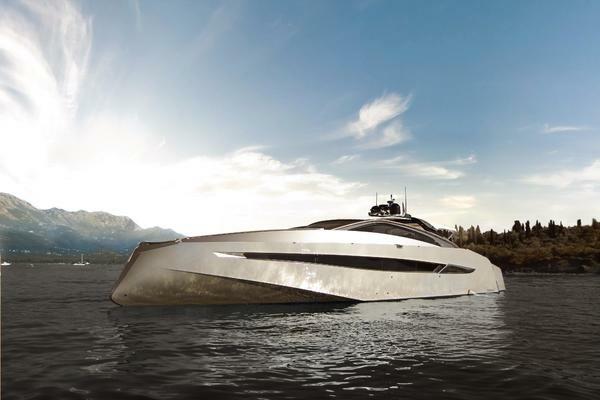 Marlow Yachts are limited production yachts built under constant supervision and stringent quality control procedures. Very few products in the world undergo the battery of tests and scrutiny designed to make your yachting experience one of pleasure. The major vacuum bagged components are built in only three major molds constituting a marvelous technological advance that eliminates dozens of potential leaks and unsightly joint areas. Resin infusion is extensively used where appropriate. The Marlow Explorer exterior finish is among the finest on earth and will look like fine porcelain for years to come. Marlow yachts are designed and built to cross the oceans of the world in comfort and safety while the proprietary Strut Keel© technology allows inland and island cruising with fully protected running gear. Marlow Yachts are certified by Bureau Veritas, ABS (American Bureau of Shipping), Lloyds Register, and ISO 9001, a status enjoyed by less than a handful of pleasure powerboat manufacturers worldwide.